450Bushmaster.net • View topic - Bought another 450 BM. My buddy can no longer shoot his CVA Hunter in 450 BM for health reasons. I will be using factory rounds this rifle season. After the first of the year I'll shoot my 275 gr test loads through it. I'll also be shooting my 240 gr test loads through my RAR. I realize that it isn't a bolt action but didn't know where else to post. Re: Bought another 450 BM. couple guys here in the plant have them, been pretty happy with them. Semi local place has a sale on the plain blued one $225 and $275 with a Tru glow scope till the 15th. Al in Mi wrote: couple guys here in the plant have them, been pretty happy with them. Dayum that's cheap! You could hardly pick up a Saturday Night Special pistol for that much. Stopped by Ben's on the way home and they were doing a brisk business on them. Well I sold the CVA to my brother as he wanted it and I already have my Ruger. I sold it to him at a loss and he is going to make payments on it. Hard to beat a deal like that. The sacrifices we make for family. I took it to the range yesterday and shot 8 rounds sighting it in and having fun with his ammo. Now I get to see what the Barnes 275 gr XPB rounds feel like coming out of my Ruger. 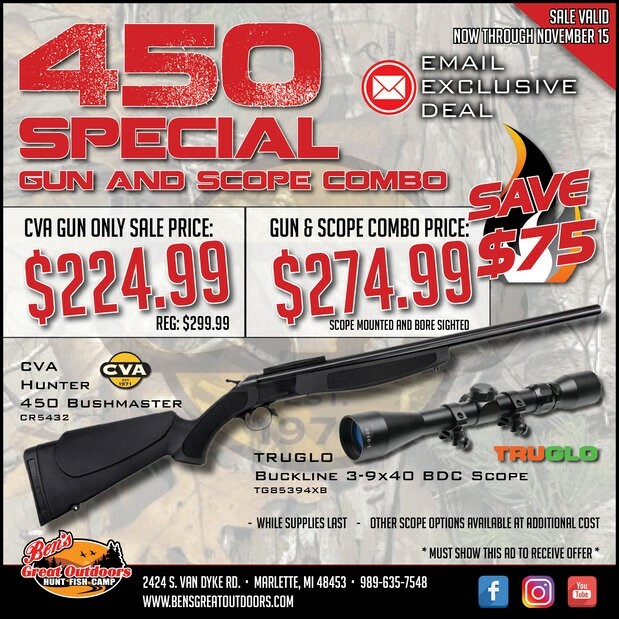 I just ordered a CVA Scout V2 in 450 BM from Buds Gun Shop. I won't be selling this one right away like I did the Hunter that I bought earlier. I picked up my new CVA Scout V2 take-down 450 BM yesterday evening from a local FFL gun shop that Swampbug told me about. What a nice looking rifle. Stainless steel action and fluted barrel with radial muzzle brake and thread protector. Also has a black synthetic forend and anbidextrious stock. I already have Barnes 275 gr XPB rounds loaded up to test for accuracy. I also have Hornady 300 gr XTP rounds loaded up to check MV as Hornady has max MV of 2200 FPS. I'll be heading to the range today or tomorrow. The only modification that I'm thinking about is putting some epoxy in the stock to take away the hollow sound and balance the rifle. Will report my findings from the range. Last edited by CJP1 on Tue Feb 05, 2019 3:55 pm, edited 1 time in total. I took the new rifle to the range on Saturday and Sunday. On Saturday I found that my 300gr loads were too light and needed to be sped up some. I loaded up some heavier loads and went back to the range Sunday. I found a load at almost 2200 FPS that looked promising and loaded more for group testing at a later date. I also took my 275gr rounds to the range Sunday to shoot groups and found load that produced 2175-2200 FPS that gave me MOA at 100 yds. I'm going to Alpena county MI this weekend for a special doe hunt and will try my 200gr XPB bullets in my Ruger. If I have time I'll take my CVA Scout out and check groups while up there. I might use it to take another doe as more people asking for venison and permits are available over the counter.